Buell will add two new bikes to the Lightning range for 2005, and will also bring back the Lightning XB12S. The Lightning CityX XB9SX is designed as a middleweight urban streetfighter with a translucent airbox cover and flyscreen, off-road style handlebars and guards and a headlight grille to protect your light. It's powered by the Thuderstorm 984 fuel-injected V-Twin, and comes with full-adjustable Showa suspension. As with all Lightnings, the fuel is carried in the frame of the bike, with engine oil in the swingarm, and exhaust below the engine. All the Lightnings have a short 52-inch wheelbade and 21-degree fork angle to make them pretty agile. The XB12S returns with the Thunderstorm 1203 V-Twin motor with the Buell Interactive Exhaust, which has an electornically operated valve in the exahust to smooth torque and give maximum power. 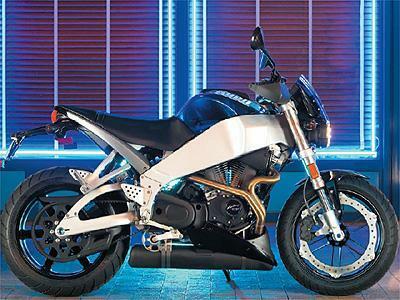 Buell claims 103 horsepower with 84 ft. lbs peak torque. It also gets the Showa suspension, and will come in Red, Black, or Blue, with a grey frame and translucent amber wheels. And the XB12Scg offers the same package, but with altered front and rear suspension and a reshaped seat to lower the centre of gravity and allow more diminutive people to ride a Buell. The firm claims that performance and handling are uncomprimised, with the seat height at 28.6 inches, 1.75 inches lower than the standard model. Could these three bikes tempt you to try a Buell? Does a translucent screen and airbox cover make you look like an urban streetfighter? Have Your Say, here.